The universe is in flux; keep your partner in sync. 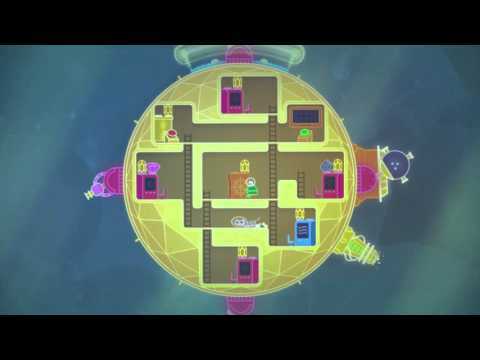 Lovers in a Dangerous Spacetime - out now for PlayStation 4. Blast off on a journey through the psychedelic spacetime of a randomly occurring universe, working as an intrepid team of two to overcome the hazards of the big deep.You need not quite be lovers, but at the very least, you’ll need to get along. Work as one half of a well-oiled operation to keep your Spacenaut afloat in the farthest reaches of space. Coordinate with your partner – a real life co-op buddy or a friendly computer-controlled pet – to man the battle stations, operate defences and refuel the engines as you encounter everything from evil robots to asteroid belts. Find and combine powerful space gems along the way to customize your spacecraft and unlock new abilities. Each galaxy is generated at random, so it’ll pay to upgrade your hardware and be prepared for anything. Go hand in hand amid the perils of a neon universe in Lovers in a Dangerous Spacetime. Buy Lovers in a Dangerous Spacetime on PS4.